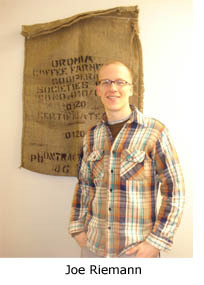 This spring, the fair-trade co-op Equal Exchange re-named one of its coffee’s “Organic Oromian.” The editors of Ogina interviewed Joe Riemann to learn what he thinks about the fair-trade movement, globalization, and the Oromo struggle. Ogina: What does "fair trade" mean to you and how did you first become interested in the fair-trade movement? Joe: Fair trade is about community. It's about farmers, workers and consumers working together to create society based on cooperation, democracy, and sustainability. It is truly the antithesis to the individualism and least common denominator effect that the ills of Capitalism so often boil down to. I became involved with Fair Trade when I worked at the Wedge Co-op starting a few years back. While I was aware of it, it was at the Wedge where I really got active with it. Through relationships with local farmers at the Local Fair Trade Network, Equal Exchange, and the cooperative movement, Fair Trade seems to be engrained in every facet of my life now – work and social. Ogina: How did you first learn about the Oromo struggle, and what do you think the fair-trade movement has to offer the Oromo people, both those living in Oromia and those living in Diaspora? Joe: I became aware of the Oromo struggle through my work at Equal Exchange. One of our producer partners is the Oromia Coffee Farmer's Cooperative Union. When my co-worker mentioned the connection between Oromia and the Oromo community here in the Twin Cites, I started doing my homework. After a few google searches, and a book or two by Professor Asafa Jalata, I became increasingly interested in the culture and history of the Oromo community. Fair trade for the small farmers of the Oromia cooperative, as well as around the globe, offers an equal footing. Traditional trade relationships are done through multiple layers of middlemen, all taking advantage of small farmers who have little access to market information, much less power to negotiate. Fair trade really puts respect back into the mix. The added funds from fair trade have gone towards building schools, wells, hospitals and processing facilities – democratically decided upon by the farmers. It's important to make the distinction that Fair Trade IS NOT artificial charity as some naysayers would suggest. This is real costs, and real long-term partnerships. No one is getting rich off this, but it is a sustainable system based on trust and solidarity. I didn't necessarily think the fair trade movement could offer anything tangible to the Oromo people here in Minnesota, but the connection seemed interesting. Coffee, democracy, so many fundamental things are shared between the Oromo community as well as Equal Exchange and the fair trade movement – it seemed like an obvious relationship waiting to happen. The documentary film Black Gold about the Oromia Coffee farmers certainly helped make that connection even easier. Ogina: What led up to your decision to change the name of one of your coffees from "Organic Ethiopian" to "Organic Oromian"? Joe: We hada co-hosted screening of Black Gold with the Oromia Student Union in early October at the University of Minnesota. There was a lot of discussion after the film, from students born in diaspora interested in fair trade to personal stories from people of Oromia whose families have been coffee farmers for generations. Scott (my co-worker) and I were later asked why the coffee was called Ethiopian when it was coming from Oromia coffee farmers. After a very encouraging dialogue with the audience, we decided it would be an interesting and worthwhile endeavor and there was a petition drive put together by a few key Oromo youths in the community. Over one thousand signatures from around the world were gathered, and we knew this would be a great thing to do with the Twin Cities community. With the strong support of the Oromo community, and the genuine interest of co-op consumers around the Metro, the name change has been a success in terms of community building and education, which was the main intent to begin with. Ogina: Your company Equal Exchange is just one part of a larger network of business and political relations. Could you talk about the relations you have with other businesses and organizations around the world? Joe: Equal Exchange currently works with more than 20 small farmer cooperatives throughout 13 developing countries (including coffee, cocoa, tea, and sugar producers). Our trading partners are small farmer co-operatives — businesses owned and governed democratically by the farmers themselves. We also just started working with small farmers in the U.S., trying to bring fair trade home, so to speak. We are members of IFAT, a global network of fair trade organizations, along with being indirectly connected with all other 100% fair trade companies out there. Being one of the largest and oldest fair trade companies, we have made a lot of through the over 20 years we've been around. There is an extensive co-op community as well, all working towards building a different socio-economic structure. Finally, we also have an extensive Interfaith Program which links us to faith-based organizations throughout the country. Churches of different denominations purchase Equal Exchange coffee for fundraising activities, as well as to serve to their congregations. Equal Exchange works in partnership with faith-based relief, development and human rights organizations to help communities of faith learn about and promote Fair Trade. Ogina: Since specialty coffee roasters such as yourself often rely on name recognition to sell their coffee, are you worried that you might loose business by changing the name of the coffee? After all, American coffee drinkers are very familiar the word "Ethiopia" but hardly anyone in America has heard of Oromia. Joe: As I mentioned earlier, there's more to what we do as a company, and fair trade relationships, than sales. Of course, to be honest, we did feel this was a change suited just for the Twin Cities (for now anyway). With the strong Oromo community here, it just made sense that people may be a little more aware, but certainly the educational task is part of the fun. Through coffee, and the bulk bins at the co-ops, we are able to help share a deeper message about coffee grown in Ethiopia, this is about the farmers and the land the coffee grows on, as well as the community here that has a strong bond to both. Ogina: Coffee is obviously an ancient cultural tradition for the Oromo people, but today coffee is a global phenomenon that has transformed local cultures everywhere. How do you understand "coffee" to be a part of "culture" both locally and globally? Some might say that the global coffee market has affected Oromo culture in positive as well as in negative ways. Joe: Coffee brings people together. Revolutions were planned in coffee shops of Europe, not the pubs. Coffee stimulates the mind, adding depth to debates and discussions between friends, students and neighbors alike. Coffee is very social, and a big part of multiple cultures – from the regions that grow coffee, to the ones that just drink it. Really, it's companies like Equal Exchange that have brought those two cultures a little closer to one another. Ogina: Our webzine, Ogina, is different from other Oromo publications because it focuses on the arts. The word "ogina" roughly means "the arts" in Afan-Oromo. So, with that in mind, I would like you to say something about the relationship of art to fair trade. For instance, does the fair-trade movement have a particular "culture" around it? Joe: Wow, these questions have gotten progressively more difficult and academic. I would say the coffee is the product of an art form, and is a cultural artifact. We work with small farmers who utilize traditional, sustainable methods of farming. Much like the many Organic and Sustainable local farmers we have in Minnesota and Wisconsin, farming is truly a magnificent and overlooked trade. The cycle of planting and harvesting, etc. – what a truly beautiful expression of humankind's ability to work with nature, and create something together. As you follow the coffee beans from the farm to Equal Exchange, there is continuity to that skilled artisanship. We have skilled roasters that watch temperatures, oils of the roasted beans, etc. to make the perfect cup. We also have quality control workers that taste every batch of coffee that leaves the warehouse. As the farmers constantly improve upon there farming techniques, we parallel that by always striving to bring out the best natural flavors of the roasted coffee beans. Our culture has really lost that aspect of farming, as well as skilled labor. Ogina: Now for a really difficult question. What do you imagine the future to be for the Oromo people? And what role will Equal Exchange be playing as that future emerges? Joe: I can only imagine for there to be more self-reliance and democracy for the Oromo people, as well as the rest of the Horn of Africa. Socio-political conflict is always intertwined with poverty and power. Once we, as a global society, can start to address power dynamics and economic injustices, the future begins to look brighter for those who suffer from social injustices. But nothing happens in a vacuum; it is up to all of us to ask ourselves difficult questions about our own government and socio-economic policies, and how we may be ultimately exacerbating problems elsewhere. As far as Equal Exchange’s “role”, well, we’ll continue to build community and raise awareness on socio-economic injustices around the globe, it’s what we do best. But we’ll also supply the coffee, cups, sugar and lots of half and half. Ogina: Do you ever despair that the fair-trade movement will not succeed? Joe: I have nothing but optimism for the future of fair trade. Look around us and we see signs of the collapse of traditional business models. The stock market, housing market, etc….they are not sustainable, and we're seeing the results. Horizontal governance instead of top-down power structures, fair wages for quality products, putting labor and farmers in the driver's seat – now that's a society worth getting excited about.